Hurricane Sandy pounds Jamaica, eyes U.S.
KINGSTON, Jamaica Hurricane Sandy pounded Jamaica with heavy rain and a powerful storm surge as it headed for landfall Wednesday near the country's most populous city on a track that would carry it across the Caribbean island to Cuba, and then pose a possible threat to Florida. At least one person in nearby Haiti was killed after being swept away by a rushing river. The island's international airports closed, cruise ships changed their itineraries and police ordered 48-hour curfews in major towns to keep people off the streets and deter looting as the late-season storm neared Jamaica's south coast. Police slowly drove through drenched communities in the capital of Kingston with their cruisers' lights flashing. The 18th named storm of the Atlantic hurricane season was forecast to make landfall in the vicinity of Kingston Wednesday afternoon and then spin on into eastern Cuba overnight. It was expected to pass west of the U.S. naval base at Guantanamo Bay, where pretrial hearings were being held for a suspect in the deadly 2000 attack on the destroyer USS Cole off Yemen. CBS News' Portia Siegelbaum reports from Havana that low-lying areas are being evacuated in Cuba. A massive cleanup of drains, rubble and rubbish is also under way. Heavy rains in eastern Cuba last July led to well contamination and numerous cases of cholera. Meanwhile, a large, wintertime jet stream dip with a lot of cold air is forecast for most of the Midwest, creating the possible scenarios that the dip could capture Sandy and pull it toward the East Coast, or let Sandy just go out to sea, Bernard reports. Forecasters at the U.S. National Hurricane Center in Miami said tropical storm conditions were possible along the southeast Florida coast, the Upper Keys and Florida Bay by Friday morning. A tropical storm watch was in effect for the area, the center said. In southwestern Haiti, a woman died in the town of Camp Perrin after she was swept away by a river she was trying to cross, according to Marie Alta Jean-Baptiste, head of the country's civil protection office. There were also reports of extensive damage to Port Salut along Haiti's far-southwestern coast after a river burst its banks. Local municipal official Darius Joseph said some residents had left their flooded homes for shelter in schools and churches. Across Jamaica, poor people in ramshackle shantytowns and moneyed residents in gated communities were growing increasingly jittery about Sandy's approach. Many sections of the debt-shackled country have crumbling infrastructure, and a lack of building codes has resulted in some middle-class homes and tin-roofed shacks being built close to steep embankments and gullies. While Jamaica was ravaged by bands from Hurricane Ivan in 2004 and other powerful hurricanes centered offshore, the eye of a hurricane hasn't carved across the island since Hurricane Gilbert in 1988, according to Jamaican meteorologist Jacqueline Spence. Stranded business travelers and a smattering of locals were riding out the hurricane in hotels clustered along a strip in Kingston's financial district. Some read prayer books or novels, while others watched movies or communicated with loved ones on computers. Cris Hopkinson, a Toronto woman who was on a business trip, said she was hoping to catch a flight off the island Friday when the stormy weather clears. "For now, I'm just hoping that the glass in the windows don't shatter from the winds," Hopkinson said in the dining room of the Courtleigh Hotel. About a mile away in the troubled neighborhood of Grants Pen, where shops have been ransacked in the past during storms, a number of young men ignored the curfew, riding on bicycles or walking in small groups in the steady rain. Cecile Graham, a mother of two teenagers, said she was worried about the possibility of burglaries or looting at the small markets and shops that line the main road. "I hope that all the police are out and we won't have the looting that has taken place before," she said. Deputy Police Commissioner Glenmore Hinds warned that police "will react swiftly to protect life and property." Some Jamaicans spent the final hours before the hurricane trying to secure their properties. Andre Howt tried to finish repairs to a neighbor's roof that leaks badly even during a common rain storm. Steady drips from the concrete ceiling were filling plastic buckets. "We don't have much time. We heard on the radio that the hurricane was coming this way," he said in the poor Kingston community of Standpipe, situated next to one of the debris-clogged gullies that crisscross the capital. "We'll be getting wet." Dangerous flash floods and mudslides were a threat for the tropical island of roughly 2.7 million inhabitants, especially in mountainous areas, Jamaica's meteorological service said. In the hilly community of Kintyre, on the outskirts of the capital of Kingston, Sharon Gayle and a few of her drenched neighbors expected to lose the town's bridge over the Hope River, which washed away a section of the span just three weeks ago during a heavy downpour. The shell of a concrete home that collapsed into the river and killed two people several years ago still lies toppled on the sandy banks. 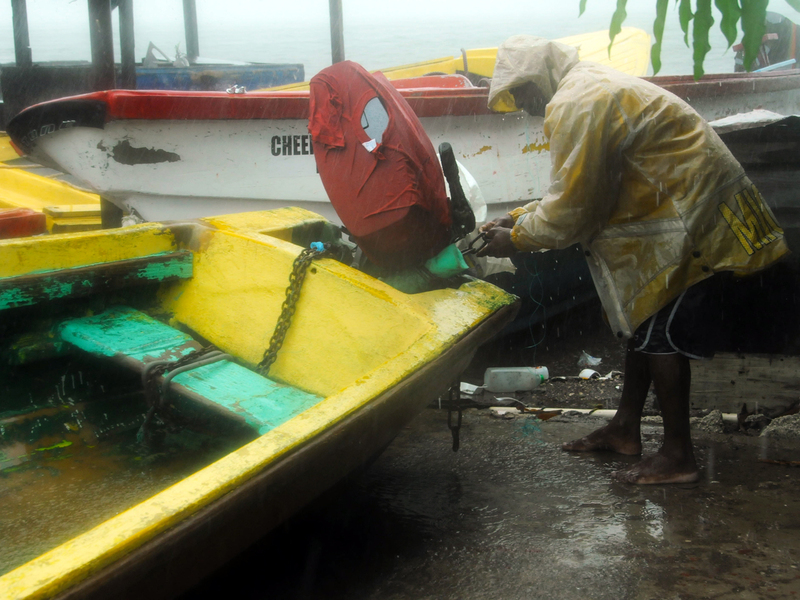 The storm was predicted to drop as much as 12 inches of rain, especially over central and eastern parts of Jamaica, the country's meteorological service said. Some isolated spots could see as much as 20 inches, according to U.S. forecasters. Battering waves and a strong storm surge were also forecast. By Wednesday afternoon, sea water was washing over the streets of Port Royal, a depressed fishing village at the tip of a spit of land near Kingston's airport. More than 100 fishermen were stranded in outlying Pedro Cays, a lobster- and conch-rich area about 40 miles off Jamaica's southern coast. Some of them told local media they lacked fuel to get back to the mainland, but authorities said they willfully disobeyed an evacuation order. On the mainland, hundreds of people moved to shelters, but others living in low-lying areas on the mainland refused to evacuate their homes because they were fearful that their possessions would be stolen. A warning siren wailed across the U.S. base at Guantanamo Wednesday as steady rain fell. The military warned the 5,500 people living on the base to begin storm preparations. Officials say there is no threat to the 166 prisoners. Elsewhere in Cuba, authorities issued a hurricane watch for several provinces and there were intermittent rains over Haiti, where a tropical storm warning was in effect. A hurricane watch was issued for the central and northwestern Bahamas, where the storm was predicted to pass Thursday and Friday morning. Early Wednesday afternoon, Sandy was a Category 1 hurricane with maximum sustained winds of 80 mph and was centered 30 miles south of Kingston. It was moving north-northeast at 14 mph. Hurricane-force winds extended outward up to 25 miles from the center. Meanwhile, U.S. forecasters said Tropical Storm Tony had formed over the open Atlantic, but posed no threat to land. The storm had maximum sustained winds of about 50 mph and it was moving east-northeast at 21 mph. Its center was 1,245 miles west-southwest of the Azores.